Mark Thompson, the Times' chief executive, said in a statement a sale would be in the best long-term interests of both properties. 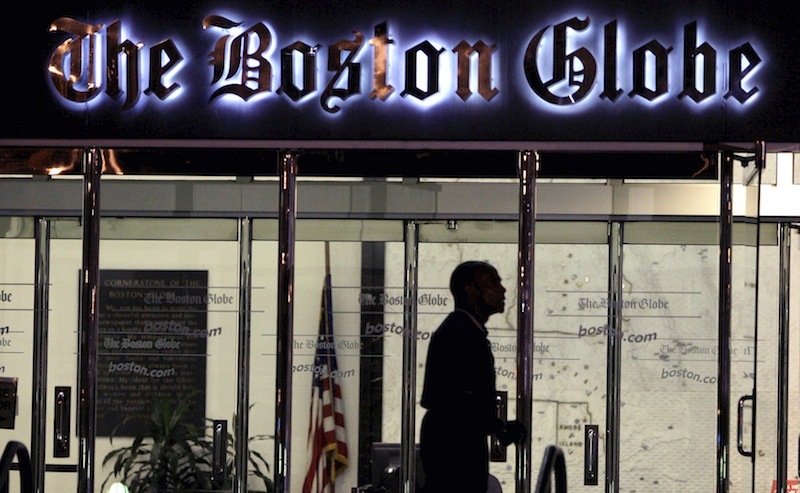 NEW YORK — The New York Times Co. said Wednesday that it is putting The Boston Globe and its related assets up for sale four years after it called off a previous attempt to sell the newspaper. Thompson said the sale would help the company concentrate its attention and investments on The New York Times’ brand. The newspapers’ differences are stark. The Times has a national — even international — audience, and has been adding digital subscribers at a rapid clip. Last year, it launched a Chinese-language website and has a loyal, growing subscriber base in the U.S. Meanwhile, the Globe is focused on its readers in the New England region, and while its digital subscriptions have been increasing, analysts believe they aren’t rising fast enough to be meaningful. The Globe had 28,000 digital subscribers at the end of 2012, up 8 percent from three months earlier. In comparison, the Times and International Herald Tribune had 640,000 paying subscribers online, up 13 percent over three months. He estimated that the Globe earned about $37.5 million in profits before interest, taxes, depreciation and amortization on $375 million in revenue. Janedis said the sale could bring in $150 million to $175 million, not including pension liabilities or the value of the Globe’s headquarters. Along with the Globe, the Times plans to sell the Worcester Telegram & Gazette; the publications’ related websites; the Globe’s direct mail marketing company, GlobeDirect; and a 49 percent interest in Metro Boston, a free daily newspaper for commuters. Led by Chairman Arthur Sulzberger Jr., the Times Co. is controlled by a family trust whose trustees are the descendants of Adolph Ochs, who bought the newspaper in 1896. The trust holds 90 percent of the non-traded Class B stock that is required to elect a majority of the board. The Times bought the Globe in 1993 for $1.1 billion from the family of Stephen Taylor, a former Globe executive. But the newspaper has faced difficulties in recent years as advertisers cut spending on newspapers and moved more ads online. A round of cost cutting in 2009, which involved pay cuts, helped put the newspaper on better financial footing. It prompted the Times to call off a planned sale and rebuff the offers of several bidders. In late 2011, the Globe started charging for access to its online version at BostonGlobe.com. The move helped boost circulation revenues. Times doesn’t separate Globe revenue from Times revenue in its financial statements. But the Globe had an average weekday circulation of 230,351 in the six months through September, up 12 percent from a year ago, according to the Alliance for Audited Media. The newspaper’s increase in digital subscriptions more than offset declines in print. But the total is still down significantly from the nearly 413,000 it boasted in September 2002. Wednesday’s announcement follows the sale of several Times assets recently. In September, the newspaper company sold its About.com website and related businesses for $300 million to Barry Diller’s IAC/InterActiveCorp. In January 2012, the Times sold its regional media group to Halifax Media Holdings for $143 million. Asset sales helped triple net income in the final quarter of 2012 to $176.9 million, or $1.14 per share, as revenue grew 5 percent to $575.8 million. Without the sales, earnings per share would have fallen. Analyst Edward Atorino with The Benchmark Co. said he views the sale as part of a strategy by the Ochs-Sulzberger family that controls the Times Co. to delist as a public company and go private. The Times Co.’s stock has fallen precipitously in recent years from above $50 in 2002 to around $4 during the depths of the recession in 2009. Since then, the stock has recovered somewhat, closing down 4 cents at $9.03 on Wednesday shortly after news of the sale broke.